Whether you live in Melbourne or are travelling with kids, it is a fantastic city to explore with kids, even more so if you feel like venturing little further out of the city. There's always something fun to do see and experience together. Many theatre shows, circuses and events roll through Melbourne regularly. If you're planning on visiting Melbourne with kids or just looking for something to do here's a list of suggestions for you. Some within the CBD, others a little further out. I am endeavouring to only include items here that will be ongoing rather than one offs, feel free to add in your suggestions in the comments too. I have written another review featuring the Top 10 Free Activities to do with Kids in the Melbourne CBD, however, for those who would like to venture a little further out, here's some free and low cost suggestions to stretch your holiday money further. Gorgeous little village townships filled with shops and cafes. We love wandering through the shops and laneways of Sassafras and Olinda. You can easily fill a day strolling together. During winter, the fire is lit in the hidden laneways of Sassafras and everyone is welcome to help themselves to a free marshmallow to toast over the fire. When you feel like a snack, there is the iconic Miss Marples Tea House, and while there are food charges, the shop holders offer free samples to taste at different times of the year. Gepetto's Workshop is a fun store on the corner of Sassafras that is filled with lovely puppets and old fashioned toys. Even if you don't purchase anything, the kids will have a ball browsing. Beautiful at any time of the year, there used to be an entry fee to the Rhododendron Gardens outside Olinda - however they are now free. You can enter and wander through the beautiful gardens marvelling at the tall trees and amazing flowers. Definitely worth the visit. Rhododendron Gardens - The Georgian Rd, Olinda 3788. Phone: 03 - 9757 7300. Feel good about yourself and donate things you no longer need. If you have been endlessly storing up those egg cartons or perhaps you have a business with boxes of offcuts, things that weren't quite right or misprinted - don't throw them out, donate them to Resource Rescue. If you have a larger quantity of items, they will even come and collect for free. Feel good instead of adding to landfill. Your supplies will be recycled and used by local art groups, schools, crafty folks and more. Want to go and visit yourself and maybe pick up a bargain, you can do so too. Heading up the Mt Dandenong Tourist Rd, you will come to Five Ways Lookout. A car park overlooks the dam and fabulous mountain views. You can park and sit enjoying the views or take a stroll and enjoy the ambiance. 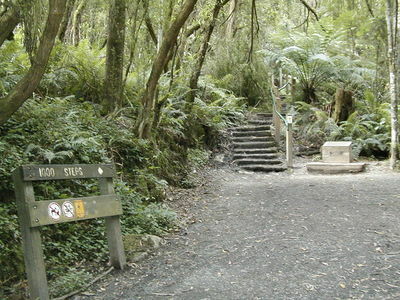 If you travel down the side of the park, there are free picnic grounds and shelters and some lovely bush walks. Continuing on a little further you will come to Sky High Lookout. Whilst there is a small car entry fee, once you are here you can relax, take a stroll, and enjoy the views for free for as long as you like. Previously referred to as 'lovers lookout', many Melburnians have fond night-time memories of the twinkling lights over the city and the sparkle in their sweetheart's eyes from Sky High Lookout. A visit to Arthurs Seat Lookout is lovely when the weather is pleasant. You can drive your car to the top and take a stroll, enjoying the beautiful seaside views. Whistle the chairlift is long gone for safety reasons, it's fun to drive down under it and imagine people swinging their legs overhead. Kids driving you crazy? If they have seemingly endless energy, take them for a walk/run/stroll/puff and pant up the 1000 Steps Kokoda Track Memorial Walk at the corner of Burwood Highway and Mt Dandenong Tourist Road, Upper Ferntree Gully. Perhaps you could wait at the bottom and pit them against each other, no just joking. Of course you would never let your sergeants out of your eyesight, but the thought of them arriving back red faced and puffy is fun, or is that me I am talking about? Looking for a relaxing day out in lush surroundings, the Emerald Lake Park may be just the ticket. You can arrive by car, on foot (pretty long journey for most) or by train from the Belgrave station aboard Puffing Billy. Bring a picnic lunch or enjoy the cafe, the kids can go paddle boating on the lake (charges may apply), swimming in the free pool and you can use the BBQ facilities and picnic shelters. The RAAF (Royal Australian Air Force) Museum is located at Point Cook (near Melbourne). It commemorates the Australian Flying Corps and the Royal Australian Air Force. It is the second oldest air force in the world. Entry is free, check opening hours and visitors over 16 will need photo ID to enter. Interactive Flying Displays are presented at 1pm on Tuesdays, Thursdays and Sundays. Set in the lush gardens high up the Mt Dandenong Tourist Road, William Ricketts Sanctuary has been a favourite of adults and children alike for years. William developed a love for the Aborigines and their culture and spent much of his life carving and creating pottery replicas, glades and intricate scenes as insights into their lives and customs. As a child I loved coming here and strolling through the grounds, in search of tiny faces and animals peeping out from hidden nooks and crannies. It is quite amazing to realise one man built this dream. Previously there were entry fees, last time I visited I was informed it was now free entry. As of the time of publication of this review, the sanctuary is temporarily closed due to storm damage, however I am sure this is temporary and it will be up and happening again in no time. Visit the William Ricketts Sanctuary wesbite for further details. UPDATE: Hand Me Downs went out of business in 2015.